Such a busy week of things going on. Not the least of them, the kit that went on sale. Thanks to all who bought one...so sorry we did not have more. I will admit there may be a black market growing for anyone who has in their possession, a Junk Drawer Advent kit they have never started... and now I am thinking "Oh, Christmas Tree" can be added to the list. Debbie did a fabulous job of wrapping every little thing so I know as the kits start arriving today you will be happy girls. Today I am sharing the class I taught in New Zealand in Oct. The class was created specifically for the event so no one else has seen it. 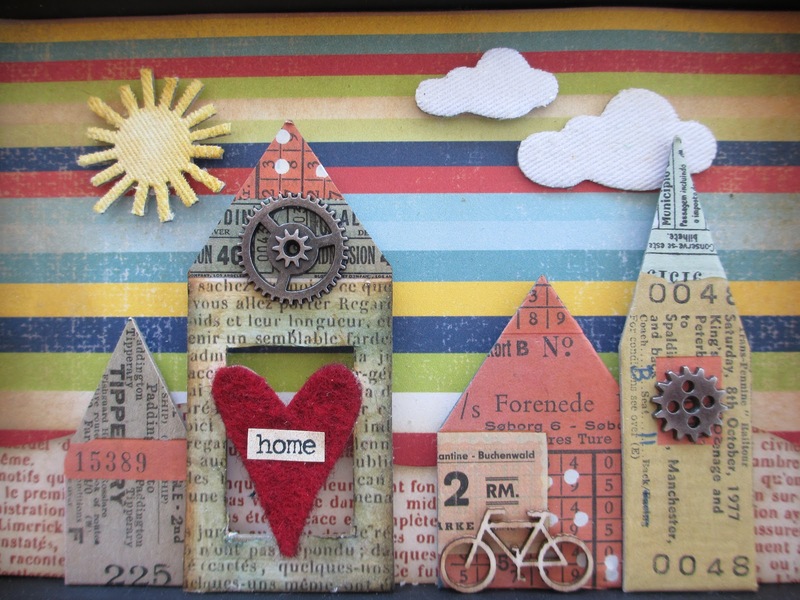 Love the bright colored 7gypsies paper that was used. There is also a cork board to pin things to in the upper right hand square and a little zig-zag book in the bottom right. I used a Cash Key for a tiny little butterfly. The stamp in the background is from the Sampers Anonymous set Natures Discovery, stamped with Archival Ink - Aquamarine. The crystal connector is a 7gypsies Binding Ring Dangle that I colored with Alcohol Ink in Aqua. We glued Tim's game pieces to thumb tacks for our cork board. A little Glossy Accents will do the trick. The little houses are from Collections Elements. Julie has such a way with chipboard...love using it. I covered each house in the leftover rubbings from the bottom left corner. Tim's Mini Gears are great to add some metal to the houses. The wood veneer bicycle and Mistable clouds and sun are from Studio Calico. The sun was colored with Distress Stain - Scattered Straw then both sun and clouds were painted with Distress Stickles - Rock Candy to make them shimmer. I used some Ranger pop-it shapes to make the houses sit up off the tray. I layered up the chipboard letters with Adirondack paint dabber - Pool, then used Archival Ink in black with my very favorite text block from the Stamper Anonymous set - Going Somewhere (I know what you are thinking, "paula, you should buy some new stamps" ...but I love this one so much!). Then finished it off with Perfect Pearls - Heirloom Gold. Yummy letters! To hold the zig-zag book in place I pushed a thumbtack through the hole in a Hinge Clip and into the wood frame of the tray. Then I added a yard of Crinkle Ribbon that was colored with Tumbled Glass, Crushed Olive and Broken China Distress Stains. In the left hand corner, 7gypsies Ticket rubbings and leftover pieces from the chipboard house sheet were used to create a mosaic of sorts. Each ticket was rubbed onto cardstock, then cut out so they could be either glued directly to the tray or raised at two different levels in the square. I used pop-it shapes and thinner Scotch foam tape to create the effect. sandra, So glad you loved the class...fun to teach but as always I wish we had 30 more minutes! Glad you finished the portfolio...LOVE that class so much. This tray is adorable! Funny that you mentioned the Junk Drawer Advent tags - I just put mine up for the holidays. I love those tags! Funny, you are not the first to email me to tell they were putting up their tags already!! Its the holidays after all! And there are a few people that left them up the entire year! Love the gamepiece thumbtack idea!!! Now what did you use to attach the dangle to the frame in the top left section? I always love your crafty goodness, Paula!! Deb and I both love CLEVER!! Love the village! Were they pre-made or did you build them yourself? I made them myself out of 3/8" foam core. If you have Somerset Studio Gallery Winter 2012, see pages 96-97 for an example of what they look like finished. I've made a set for two sisters, now I'm making a set for me! ceparie, I do not have that issue as our Michaels store has not had it for sale. I will have to see if I can find it somewhere else. Great idea. RU kidding?!?!?! No way would I give up my advent calendar kit - a kit that I actually finished and will have up this holiday season - all the tags are so beautiful! I received my Christmas tree kit while I was gone this weekend and I'll be opening it up to check it out tonight (because I want to savoir the moment!!!). I am looking forward to the holiday ideas that you share this year - they are ALWAYS the best!!! Hmmm I wonder what wonderful kit will be created from this years inspiration?? ?